When I found this beautiful soft pink colored glass, I couldn't wait to make something with it. 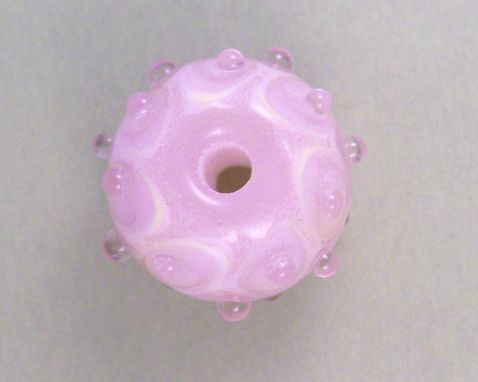 This is a round bead created using CIM's Gelly's Sty Pink, Desert Rose and Effetre transparent light rose stacked dots. The final touch was to leave the last transparent dots raised. 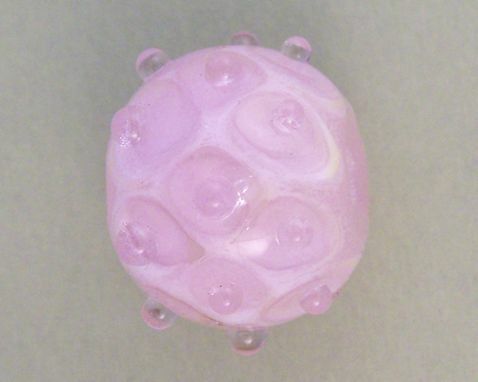 I've always been a fan of pink and I think this would make a very delicate looking pendant, or a necklace using the pink lintels I have posted in another listing. I work with soft glass of many different brands and types. As a professional lampworker, my beads are kiln annealed several hours for strength and durability. I personally inspect each bead for flaws and I thoroughly clean the bead holes with my trusty Dremel tool. Bead sets are only temporarily strung to inspire your creative juices! Any spacers used are included in the sale. Should you not be satisfied with your purchase I am more than willing to exchange or refund according to customer desires.